For other uses, see Bark cloth (disambiguation). Hawaiian kapa from the 18th century. Barkcloth or bark cloth is a versatile material that was once common in Asia, Africa, and the Pacific. Barkcloth comes primarily from trees of the Moraceae family, including Broussonetia papyrifera, Artocarpus altilis, and Ficus natalensis. It is made by beating sodden strips of the fibrous inner bark of these trees into sheets, which are then finished into a variety of items. Many texts that mention "paper" clothing are actually referring to barkcloth. Some modern cotton-based fabrics are also named "barkcloth" for their resemblance to these traditional fabrics. Barkcloth has been manufactured in Uganda for centuries and is Uganda's sole representative on the UNESCO Intangible Cultural Heritage Lists. Today, what is commonly called barkcloth is a soft, thick, slightly textured fabric, so named because it has a rough surface like that of tree bark. This barkcloth is usually made of densely woven cotton fibers. Historically, the fabric has been used in home furnishings, such as curtains, drapery, upholstery, and slipcovers. It is often associated with 1940s through 1960s home fashions, particularly in tropical, abstract, "atomic" and "boomerang" prints, the last two themes being expressed by images of atoms with electrons whirling, and by the boomerang shape which was very popular in mid-century cocktail tables and fabrics and influenced by the Las Vegas "Atomic City" era. Waverly, a famed design house for textiles and wall coverings between 1923 and 2007, called their version of this fabric rhino cloth, possibly for the rough, nubbly surface. American barkcloth shot through with gold Lurex threads was called Las Vegas cloth, and contained as much as 65% rayon as well, making it a softer, more flowing fabric than the stiffer all-cotton rhino cloth or standard barkcloth. A Hibiscus flower pattern on barkcloth. 1950s barkcloth table cloth with botanical design. ^ "Bark Cloth Making in Uganda". unesco.org. ^ Sancaya, Rengga. "Kabola, Suku di Alor yang Pakaiannya Kulit Kayu". DetikTravel. Retrieved 3 September 2018. ^ Vintage Barkcloth, December 21, 2009 at RetroRenovation.Com. Accessed June 17, 2010. ^ Vintage Las Vegas Caprice Drapery Fabric from Waverly Accessed June 17, 2010. 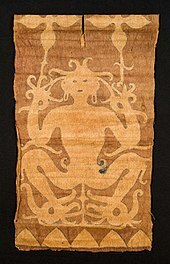 Wikimedia Commons has media related to Barkcloth. 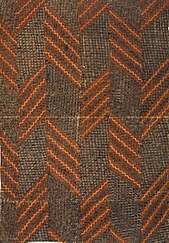 Look up barkcloth in Wiktionary, the free dictionary.